Your user title changes automatically based on the number of posts you have accumulated over time. Click "Settings" at the top of any page. Click "Edit Avatar" in the left navigation bar. Under "Option 2 - Upload Image From Your Computer", click "Choose File". Navigate to your avatar image and select it. Your avatar should appear at the top of the page under the heading "Your Current Avatar". The Virtual Weber Bulletin Board does not provide photo hosting. In other words, you cannot upload photos to our server and include them in your posts. However, you can link photos to your posts from popular photo hosting websites like ImageShack, Imgur, Webshots or Flickr. 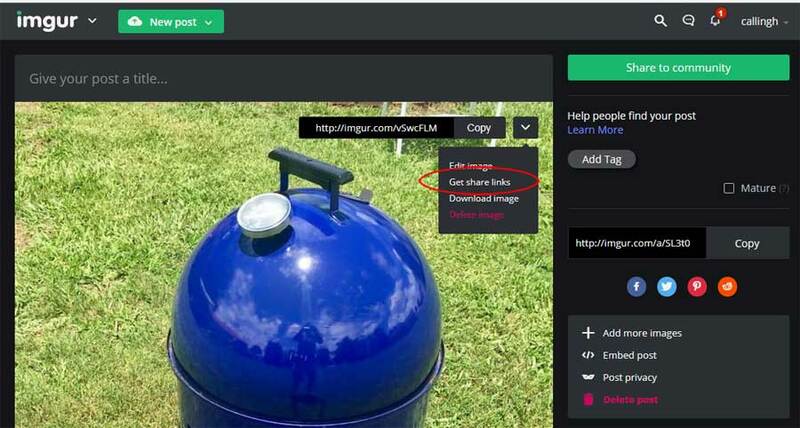 Go to Imgur and upload a photo to your account. 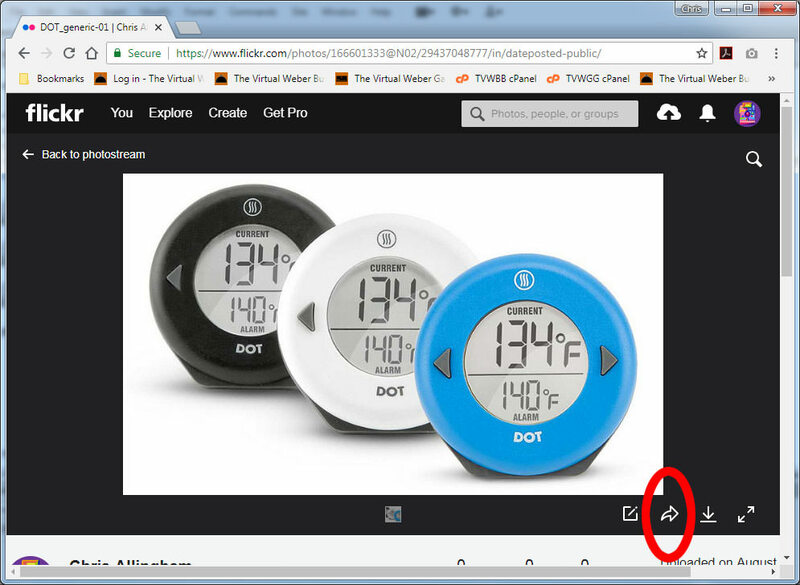 After the photo uploads, mouse-over the photo, then mouse-over the "Down" arrow at the top right of the photo and click "Get share links". Click the "Copy" button next to "BBCode (Forums)". This copies the code necessary to link to your photo. When you click "Submit New Thread", your photo appears as part of your post. 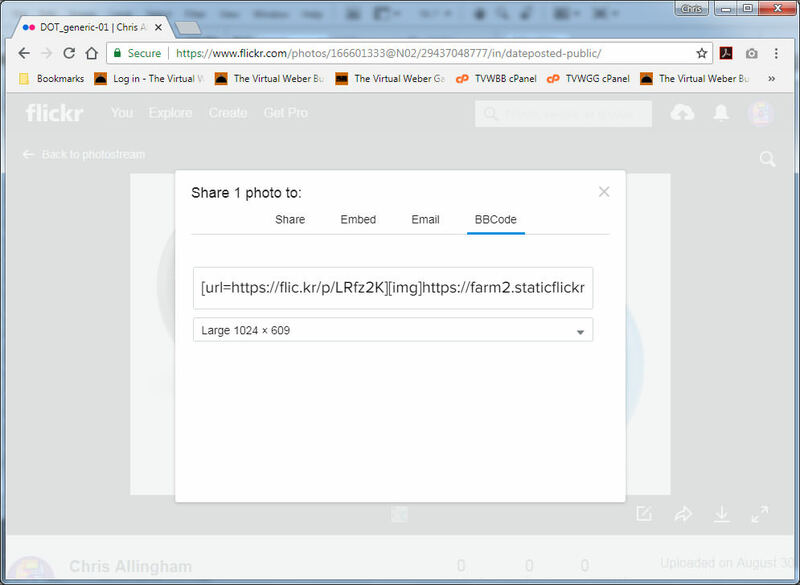 For Flickr, once you've uploaded a photo to your Photostream and made it public, click the photo then click the "Share" icon. Click the BBCode tab and copy the BBCode. The process is similar for other photo hosting websites. See your photo site's Help Page for details. The Virtual Weber Bulletin Board does not provide video hosting. In other words, you cannot upload videos to our server and include them in your posts. However, you can link videos to your posts from YouTube and other video hosting websites. Now write your discussion forum post. Above the text box where you type your message, click the 'Insert Video' icon--it looks like a piece of movie film. Paste the URL into the pop-up field and click OK. When you click Submit New Thread, your video appears as part of your post. In addition to YouTube, several other video hosting services are supported. Read the text below the pop-up field for details. When you register, your username must include a version of your real first/last name. Forum username is your introduction to fellow forum members. It's your "Hello, My Name Is" name tag, just like you would wear at a backyard BBQ party. It should be easy for others to read and understand. For example, if your name is Thomas Alva Edison, good usernames include Thomas Edison, T Edison, TA Edison, Thomas E, Thomas A.E., Tom E, etc. If during registration the forum software says that your preferred username is already in use, please add a city or state after your real name to differentiate it, e.g. "T Edison NJ". Do not use area code or ZIP code in place of city or state. If you would like to include a nickname or handle as part of your username, add it after your real name, e,g. "T Edison - BBQInventor". Username should not be initials only or last name only, e.g. "T.A.E." or "Edison". As a general rule, username should not include numbers. Business names and competition team names are not allowed as part of your username. We want to avoid having the username field become a form of advertising or promotion. However, you are welcome to add this information to your profile. Why have we used real names for all these years? Because when we use real names, posts are more friendly, more personal, and the replies you receive are more helpful. Real names help TVWBB stand out from other barbecue forums and it's one of the reasons for our success and longevity. We reserve the right to modify your username at the time of registration for clarity and compliance with our real name policy. If you're concerned about privacy, don't hesitate to contact us so we can discuss a username that satisfies both of us. Welcome To The Virtual Weber Bulletin Board! 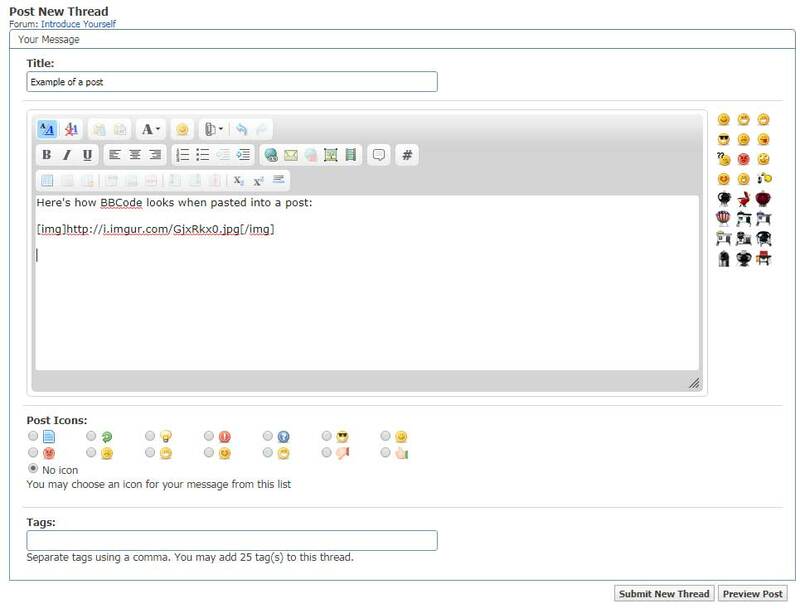 The Virtual Weber Bulletin Board provides a friendly forum for Weber grill owners and barbecuing and grilling enthusiasts to share information with one another. Keep your replies on-topic. If reading a message causes you to come up with an unrelated question, start a new message thread. Discussion, asking and answering questions, sharing recipes, usage tips, special projects, etc. is favored over chatting. When posting to the forum, please be kind, don't be a jerk, and keep things civil. Users are not permitted to, among other things, post abusive, hateful, or harassing information about any person or entity. Crude language, crude humor, and sexual content of any kind is prohibited. This is a G-Rated site, so please post accordingly. TVWBB does not confirm the validity of information posted on this message board. We cannot actively monitor all the content of posted messages and are not responsible for any messages posted. Remember that the posted messages express the views of the author of the message, not necessarily the views of TVWBB. TVWBB reserves the right to delete or modify any message, avatar, profile image, signature, username, URL/clickable link, or other member profile field for any reason, or no reason whatsoever. You remain solely responsible for the content of your messages, and you agree to indemnify and hold harmless the members of this message board, TVWBB, and their agents with respect to any claim based upon viewing of this board and/or transmission of your message(s). If you feel that a posted message is objectionable, please report it by clicking the "Report Post" icon. We have the ability to delete objectionable messages and we will make every effort to do so, within a reasonable time frame, if we determine in our sole discretion that deletion is necessary. This is a manual process, however, so please realize that we may not be able to remove or edit particular messages immediately. Post messages, images, avatars, profile images, or signatures of a political, religious, or controversial nature. No proselytizing for religious or political purposes or for any other cause or organization. The discussion of politics and religion tend to degenerate quickly in online communities, so for this reason discussion of these subjects is not allowed. Do not even make indirect references to these subjects in posts. Posts in violation of this rule will be deleted. Members who violate this rule may be banned. Use profanity of any kind on this board. Posts that contain profanity will be deleted summarily. Repeat violators of this policy may be banned. Post advertisements, chain letters, pyramid schemes, and solicitations. This includes the use of an avatar, profile image, or signature intended as an advertisement. These will be deleted summarily. Violators of this policy may be banned. Most bulletin boards have policies that prohibit people from posting messages that promote their own products, services, events, blogs and personal/business websites—and TVWBB is no exception. If you are a satisfied (or dissatisfied) customer of a product/service/event/blog/personal website/business website, and you do not have a financial interest in that product/service/event/blog/personal website/business website, you may discuss it on the bulletin board. Positive and negative feedback from actual customers is one of the most helpful aspects of a bulletin board for those considering the purchase of a product/service or participation in an event. Messages about sales, discounts, promotion codes, free product samples, etc. are fine, as long as you do not have a financial interest in the product, company, or promotion; and the offer is available to the general public. Messages that promote your product, service, event, blog or personal/business website. Messages that draw comparisons between your product/service/event and a competing product/service/event. Messages that answer customer service questions or provide technical support for products. Messages that inquire about customer satisfaction with products/services/events. Messages that discuss product/service/event development or improvement. Messages about sales, discounts, promotion codes, free product samples, etc. From time to time, TVWBB offers exclusive discounts or deals for members on barbecue-related products from various companies. A member must receive prior approval by e-mail from TVWBB before negotiating any discount or deal on behalf of members. TVWBB will consider the quality, relevance, and appropriateness of the offer to members when deciding whether or not to approve the request. TVWBB participates in the Amazon Associates Program and the ThermoWorks Affiliate Program and receives a commission when you make purchases using these links. This helps defray the cost of site operation. TVWBB reserves the right to update or redirect links in user posts, without notice to the user, either manually or programatically through the use of automated scripts, vBulletin plugins, third-party link skimming services or other technical means, so that links credit TVWBB for any affiliate programs the site participates in. Members may not post their own affiliate links for programs they participate in. Such links are subject to conversion to TVWBB affiliate links or may be deleted at our discretion. Repeat violators of this policy may be banned. By posting content on this message board, you agree that TVWBB can quote from, or reuse the content in promotional materials, newsletters, social media channels, or other documents without notice. TVWBB reserves the right to, at its discretion, terminate the membership of any user for any reason, or no reason whatsoever. If you are a copyright holder and would like to submit a DMCA report/takedown notice, see TVWB's Legal Information & Privacy Statement. If you have any questions about how this online community is run, click Contact Us at the bottom of any page and let us know.